The UK Customer Satisfaction Index (UKCSI) is a research project commissioned by The Institute of Customer Service. 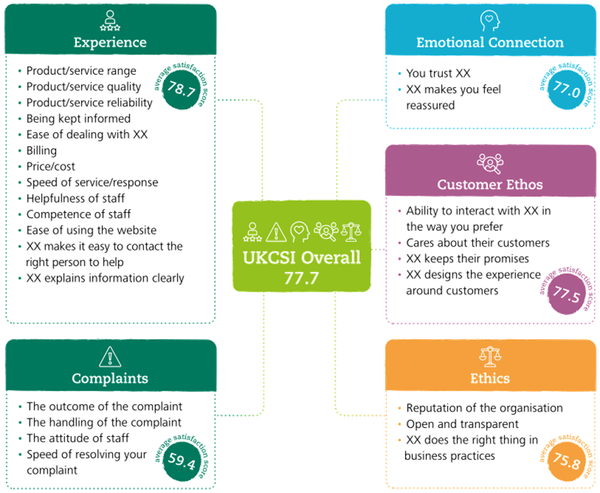 Published twice a year, in January and July, the UKCSI provides insight into the state of customer satisfaction in the UK for 13 key sectors. The UKCSI has tracked customer satisfaction in the UK since 2008. During this time we’ve seen significant change, with more challenging customers, and many sectors and organisations undergoing transformation. This year has seen the introduction of new measures that give a richer understanding of current customer needs and priorities, whilst maintaining a consistent, robust benchmark of customer satisfaction performance. The UK Customer Satisfaction Index in January 2019 is 77.7 (out of 100 points); 0.4 points lower than a year ago and 0.2 points below July 2018. Though the decline in customer satisfaction is modest, it is the third consecutive drop and customer satisfaction in the UK is at its lowest point since July 2016. New for the January 2019 UKCSI, is the customer satisfaction scorecard. This contains five dimensions reflecting the effectiveness of customers’ interactions with organisations, as well as the quality of their overall relationship with an organisation. The UKCSI is an excellent source of insight and contains data on 13 sectors from Retail, Banks and Insurance, to Transport, Utilities and Public Services. Specific organisations are also included in the research, which provides a fantastic insight in the changes in customer satisfaction for some of the top UK brands. Retail (non-food) is the strongest performing sector and Transport the lowest. The bank first direct top the UKCSI in the latest results, John Lewis are second, followed by M&S Bank, Next, Amazon.co.uk and Nationwide. Download the free 'The state of customer satisfaction in UK' executive report from the Institute of Customer Service's website. It’s a fascinating read, and a great source of information on the wide range of factors affecting customers' satisfaction. The research is based on 45,000 customer responses representative of the UK population. There is a focus around 25 key metrics that measure the quality of customers’ interactions and relationship with organisations. Customers are asked to rate their experience of dealing with a specific organisations in the previous three months. 259 organisations received a UKCSI rating across 13 sectors.